devices for home use within the designated countries. Medical Devices within the directive EEC 93/42. a more advanced CB Certificate. in the majority of countries including USA, Canada and Australia. 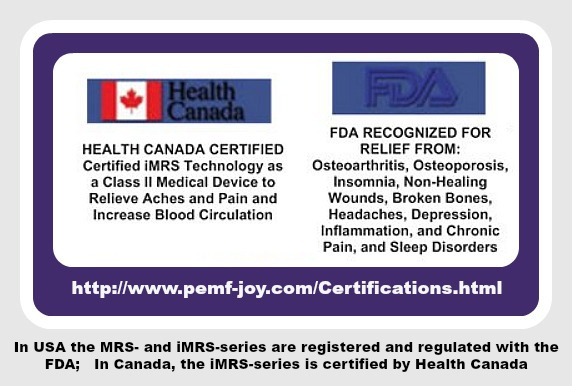 The iMRS® Systems are listed and regulated by the FDA and by Health Canada. mitigate or prevent any particular disease. any specific health claim aside from the legally authorized intent of use. of Swiss Bionic Solutions Holding GmbH. worldwide known and established Android platform. 1. The Swiss Bionic Omnium1 PEMF system is the only one in the world based on the Android Tablet system. 3. The NASA Study confirms that weaker PEMF fields actually work BETTER. So More is not Better!! Swiss Bionic uses Pulsating Earth-based Frequencies. 4. Polarity Changes North to South every 2 minutes. Pulsed Electro Magnetic Field (PEMF) devices for home use have been on the market for over two decades. Swiss Bionic Solutions, the only company in the world with its own in-house research, engineering, development, and manufacturing divisions, is the world leader in PEMF systems for home use. Our legendary MRS 2000 + series of products have been on the market for over 20 years, with an estimated 500,000 daily users worldwide in 35 countries. Our recently most modern iMRS-Series is the culmination of more than 15 years of experience in PEMF and energy medicine and more than 1 billion in-home applications/year worldwide (Note: 500,000 systems x 2 user x 3 applications/day x 365 days = 1,095,000,000 applications/year). With the innovation of the iMRS people have the opportunity to access a wide range of additional options for the first time in history (iSLRS with two additional components of the light spectrum, iGUIDE with a virtual catalog of preset programm sequences and iMORE technology). After the launch of the first humans into orbit, it became obvious that human (and animal) bodies cannot be separated from Earth’s magnetic field, without dire consequences. After approximately one hour in orbit, U.S. and Russian astronauts began to suffer major loss in bone density, and muscle deterioration. Research into the effects of Pulsed Electro Magnetic Fields became an urgent priority at NASA. NASA 4 year study, tested frequencies. 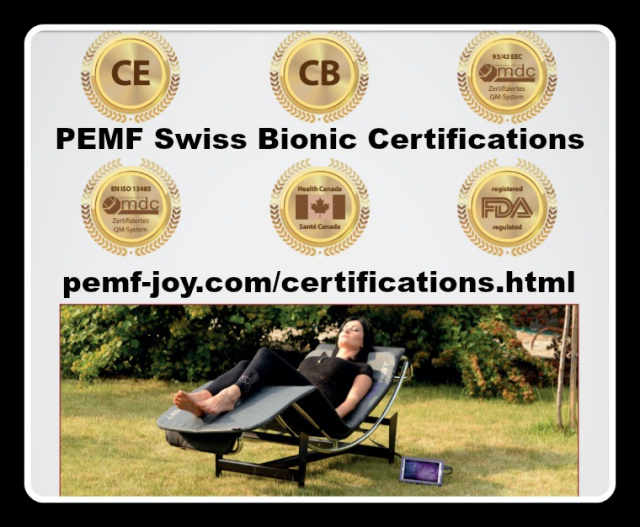 The science of the PEMF Omnium1 Mat by Swiss Bionic is based on NASA studies, testing frequencies. Omnium1 Mat uses copper coils. Animals love the PEMF Omnium1 Mat frequencies. We heard directly from Wolfgang Jaksch, Founder of Swiss Bionic ~ in a Workshop in Vancouver, BC March 2017 ~ Swiss Bionic is #1 in the World, with 1.5 Million users and 7,000 Reps worldwide. Swiss Bionic has been in business for over 20 years. Out of the 250 PEMF Manufacturers worldwide, Wolfgang (Founder and CEO of Swiss Bionic) says that 240 of them are not electrically safe (no CE certification) and that Swiss Bionic is the only one compliant and certified by Health Canada as a “Medical Device”. Other companies don’t have the money to seek certification as it takes lots of work, documentation, money and clinical evidence. It is technology proven by NASA and Recognized by the FDA, as well.